My name is Yoshida Kojiro. I live in the city of Himeji in Hyogo prefecture. 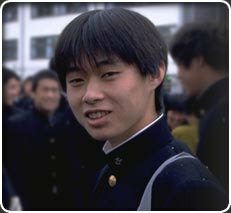 I'm a third-year student at Ichikawa High School. I'm a member of the kyudo (Japanese archery） club and serve as the head of the club. I am very fond of animals and plants. We have had many pets in our house since I was little. I feel natural when I am with my pets. Right now I am aiming for some kind of work as a veterinarian relating to protection of wild animals.